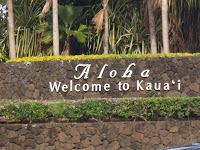 So after months of looking forward to any vacation anywhere - and then weeks of anticipation after we finally decided what the heck- Hawaii is back on our list....we finally arrived in Kauai. A little late, but still in the afternoon. 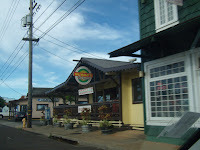 The plane from Oahu to Kauai took off at the time it was supposed to land in Lihue, never found out why. But still - we are there! And it is a lovely day. Sunny off and on, a bit muggy (but not nearly as muggy as we remember). So we went off to get our splurge - a convertible! 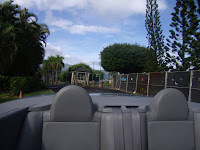 Because our plane was late we only had choices of white or gray left....but still, it is a convertible in Paradise! 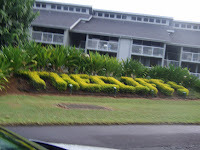 We were so looking forward to eating at the WONDERFUL restuarant at the Princeville Hotel again. Fantastic food and the most wonderful place to watch the sunset over Bali Hia.....only to find that the entire hotel is closed down for 7 months for complete renovations....and they dont know whether or not they will be opening the restuarant again! As we suffered to try and stay awake until a decent hour, we did go out onto the cliffs and watch the sunset on our first night there. Complete nightfall by 7 PM...which makes it very hard to stay awake (after all, 7 PM was 10 PM to our bodies) until a decent hour to fall asleep. 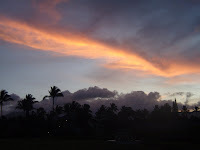 We had stopped at a grocery store and stocked up on supplies, and didnt eat lunch until around 4 PM so our first night dinner in Paradise was microwave popcorn and wine! And jsut so you know - even though you know pay for each and every bag you check thru on the airline (after all you shouldnt have to check in luggage when you are going on a vacation should you????) and pay an extra fuel surcharge fee...bla bla bla.....Hawaaiian airlines does still provide you with complementary soft drinks/coffee/tea/juice and water AND a meal!!! They also give you EXPIRED coupons for Hilo Hatties.....And BTW, you can get anything that is sold at Hilo Hatties cheaper at Walmart, Kmart, Longs, and Costco! The next morning hubby got up very early....well, we both got up early cause our inner alarms were still messed up.....but he went out and played golf and I jsut lazed around, met the local alarm clock and other birds. That afternoon we went for a ride and saw some of the beaches in the area.